Former World Champion lightweight Tonia Williams is rekindling her passion for rowing by capturing it in original artwork for those with an eye for rowing. The idea of o4rsom.com grew from an unsuccessful search for quality contemporary rowing artwork that began more than 20 years ago, when Tonia struggled to find inspiring visuals from anywhere in the world that captured the essence of the sport she knew and loved. These works are created for rowers (and those who appreciate rowing) by someone who knows, loves and understands the sport. They are based on both a scientific and an emotional response to the power, beauty, symmetry, and dedication of rowing. Each piece draws on Tonia’s technical skills - honed during a 20 plus year architectural and urban design career, that enables her to accurately ‘construct’ the components of each image; boat, water, athlete(s). They flow from an intimate knowledge of the physiology and psychology of rowing, and a delight in the visual beauty of the sport that sets it apart from any other. Tonia reckons she has found her ‘Zen’ place producing these pieces. She thrives on capturing the essence of a sport loved by many the world over and hopes you will too. I grew up in, on and around water, as many Kiwis do, inheriting my parents genes and love of New Zealand - the place they made home from the UK. Rowing was an inevitable although late discovery for me, made by joining the local club in my university years. In the late eighties, North Shore Rowing Club (NSRC) developed a successful culture of excellence and inclusion, perpetuated by two of the sports great mentors. Fresh from their own international rowing careers, Jane and Mike Stanley developed successful women’s and lightweight squads, winning multiple NZ titles and Gold Coats. I thrived in this environment and went on (with three fellow NSRC athletes) to stroke NZ’s first women’s eight to race overseas; the NZU 8+ coached by Stephanie Foster, winning the World Boat Race at Brisbane Expo in 1988. This taste of international glory pre-empted a move into the single scull and lightweight events, plus a ramping up of the training schedule to fit around the final years of an architectural degree. Weighing up the options of travelling to Europe in a kombi with a bunch of fellow graduates, or travelling to Switzerland as suggested by NZ Rowing coach Harry Mahon, I chose the latter, and in 1989 worked for a local architect for 6 months while travelling to European regattas. I returned to NZ to win several titles, but did not gain selection for the NZ squad. In 1990 I was invited to relocate to Nottinghamshire County Rowing Association in the UK, where I joined their high performance squad and gained selection to row for Great Britain (plus England and Wales). In 1991 I competed in both the lightweight coxless four and lightweight double scull, eventually choosing the double, in which I placed fifth at the European and World championships. The following three years, I stroked the British lightweight four, winning silver, gold and then silver medals at consecutive world championships. The gold was British rowing’s first ever sweep-oar gold medal for women, catapulting our crew into the media and onto the hospitality circuit. Invitations to No. 10 Downing St followed, and we found ourselves attending functions with Graham Obree, Sally Gunnell, Colin Jackson and Lindford Christie, plus a host of other British sporting greats. Holder of several NZ, Welsh and GB rowing titles, I retired from elite international rowing in 1996, but made a brief comeback in 2002, winning the mixed double with Richard Newey at the world Masters Games in Melbourne, Australia. I am now Commodore of NSRC (following 5 years rebuilding the club as President), and currently involved in the club redevelopment. 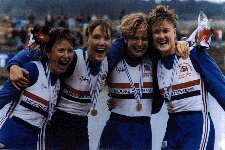 Great Britain Women's Lightweight Coxless Four, 1993 World Championships, Racice, Czech Republic. Left to right: Alison Brownless (Thames RC), Jane Hall (Kingston RC), Annamarie Stapleton (Thames RC), Tonia Williams (Notts County RA). The above photo & words pinched shamelessly from Thames Rowing Club's website.